“JESSE JAMES” the Geoffroy cat was proud of his name. Like his namesake he was a loner, feared by many, resourceful even though he had a rather large following of fans and was very popular. He paced back and forth in his enclosure not because he was bored, unhappy or had a case of OCD. As Jesse was fond of saying, “I am a cat. And that’s what cats do”. If Jesse had to tell you about his lifestyle he would classify himself as “a wild and crazy cat with an emphasis on wild”. As he puts it, “I like to take it easy during the day but when the sun sets I’m looking for a good meal and some fun. No basement or second floor apartment for me. This urban kitty prefers its sleeping shelf high in the air just like my relatives in South America except they live in treetops; I would prefer a penthouse”. I am also a cat with many names; Geoffroy’s Ocelot, Gato Montes (Mountain Cat) or as the good people at Guinness Book of World Records like to call me “one of the smallest species of wild cats in the world”. I guess I do look like a wildcat. Though I’m about the size of a domestic cat, weigh between six and fourteen pounds, it’s the small dark spots that cover my body that make our fur quite unique and very popular with people. In fact, with all the dangers and threats in the world facing our species today, man is our main predator. After reading about all the poaching and hunting that is happening all around the world, I’m so glad to be safe and a part of Animal Rentals. 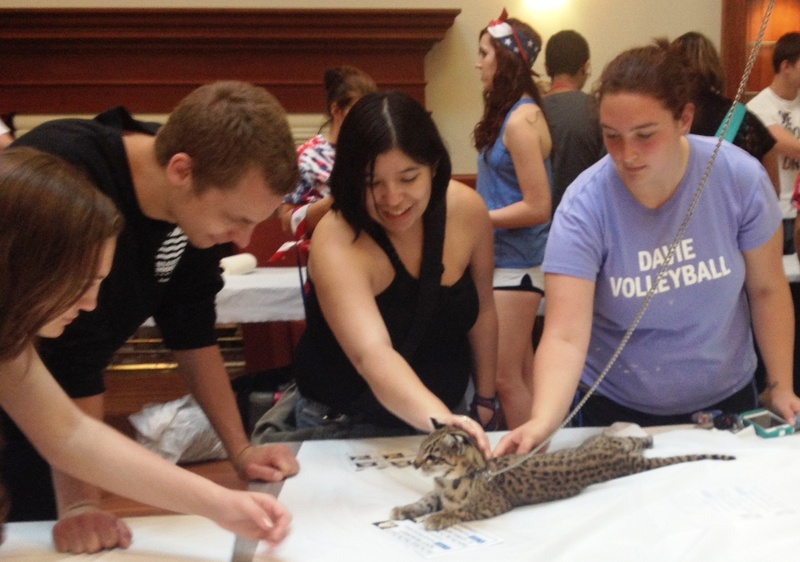 Their animal shows strive to teach people the importance of caring for our wildlife. People sometimes get the notion that I’m rather shy and aloof. Actually, I am very outgoing and love entertaining people, especially children who often ask my handler if I am a miniature leopard. Sometimes I wish I was a leopard especially when my friends at Animal Rentals play tricks on me. 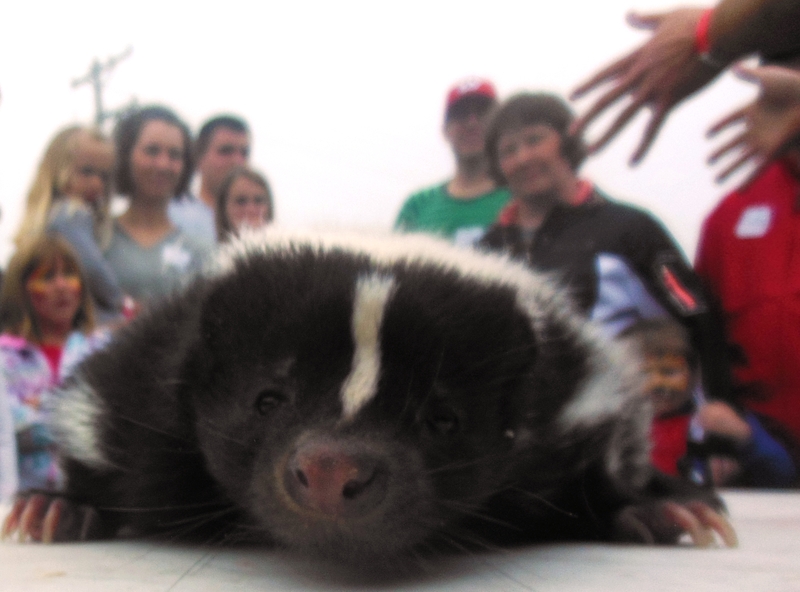 Sylvester the Skunk likes to leave bottles of spot remover in my pen. Another time Sahara the Fennec Fox, who rarely plays tricks on anyone, thought it was funny to hang a sign on my pen that read “Spot” the Kitty Cat. I take it all in stride because I know that they are my friends and very soon I will have my revenge. When we are working, Pokey the Porcupine and I have viewing tables all to ourselves. 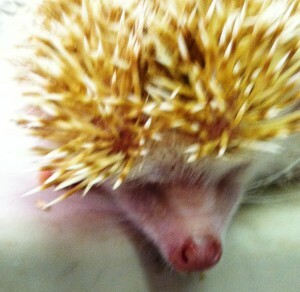 No one wants to be with Pokey because he leaves his quills all over the place and likes to chew the table cover. Because I am so energetic and like to move around, I require a table just for me. I have a water dish and litter box that I rarely use. I think I may have what you humans call a “shy bladder”. If I was asked what was the best part of being a member of Mindy’s Menagerie I would have to say meeting new people, posing for photos and making new friends. 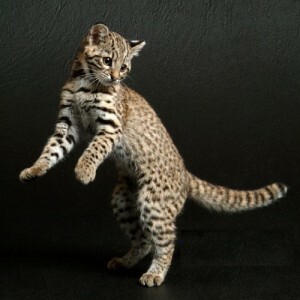 What else would a Geoffroy cat want? “HELLO “ “HELLO” “POLLY WANTS A CRACKER”! Now that I’ve got that out of the way let me introduce myself. My name is PIWACKETT although all my friends call me “FULL OF RACKET”. I am a Scarlet Macaw and have been a member of Mindy’s Menagerie since its inception. A little bird told me that the powers that be would like for me to give you some history about myself and what it is I exactly do. I don’t remember too much about my early childhood. My “bird certificate” shows I was hatched in 1989 and was an only child. Like most of us parrots, I am a “lefty” using my left foot to handle food and grasp and eat things like fruits, vegetables and for some strange reason only God knows, pieces of clay found on the banks of the river which by the way are delicious. Before my flight feathers were fully developed dad literally took off. One moment he was perched on a branch in the Amazon rain forest. A second later he was gone. “Sidney”, a notorious “stool pigeon’, told mom that dad was working in a bird show in Central America and doing quite well. I don’t know if that’s true but I sure did miss him. Anyhow, mom took me under her wing and did her best to raise me. We lived with a small group of macaws who taught me how to live well and survive in a harsh world. When I was old enough to leave the nest I bid goodbye to mom thanked my friends and flew the coop towards the bright lights of the city where I looked to make my nest egg. I don’t wish to brag, but I am a gorgeous bird. When preening myself in the mirror I see a striking scarlet feathered, svelte 2 pound magnificent specimen looking back at me. 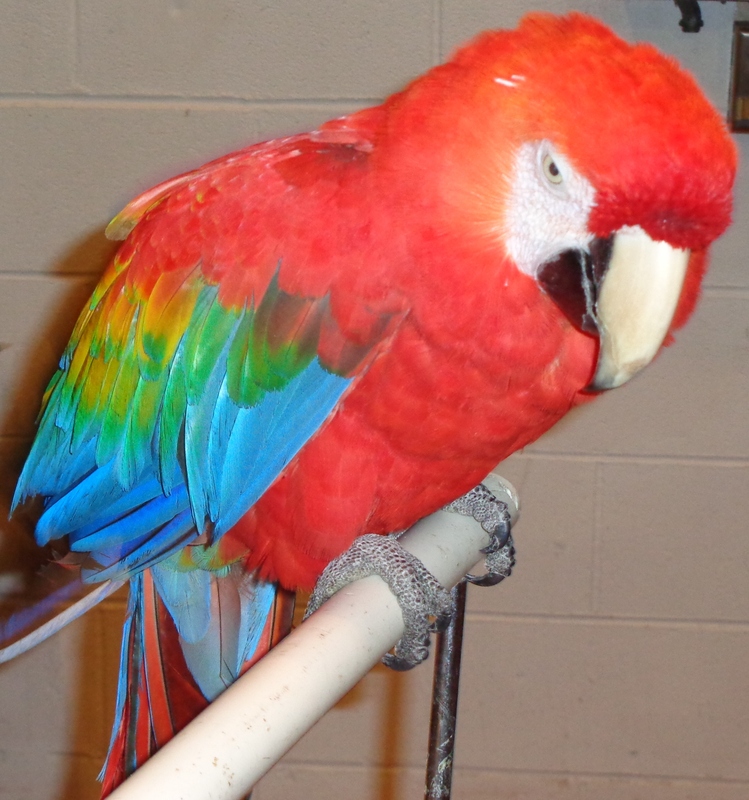 It’s no wonder that Bill Hoffman of Animal Rentals chose me over all the other macaws. Also, being a Scarlet Macaw that happens to be one of the largest parrots in the world didn’t hurt either. 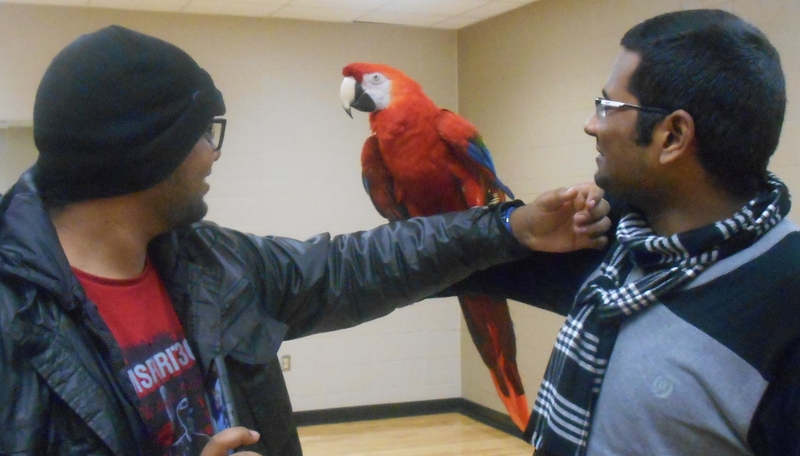 After a few months of training I became a fledgling member of Mindy’s Menagerie and a huge part of their animal shows. With beauty comes attitude and I sometimes feel sorry for my coworkers. Like a 4 to 8-year-old child, I’m filled with energy and love to play, I but can also be a bit sassy. I am proud to say there is not a lock in the world that I can’t pick and share my special talent with my friends where we spend more time on the outside of our pens rather than inside. I have distinct likes and dislikes and if I don’t like what you say I can give you one heck of a bite. Just ask Mindy the monkey who won’t soon be taking any more of my peanuts without permission. I bore easily and when feeling a bid down, I let everyone know with very loud screeching, screaming and temper tantrums. That’s why I’m glad to have plenty of companions like my macaw friends Carlos the Catalina Macaw and Simone, Ruby the African Grey Parrotand Tootsie the Green Cheek Amazon. On days when we are not working we spend hours chattering, whistling and teaching each other funny noises and human phrases. You know, I guess I really did reach the top of the pecking order in my life the day I joined Mindy’s Menagerie. I knocked on the door of Sylvester the skunk’s enclosure. While waiting I heard a strange hissing sound as if someone was spraying something in the air. Moments later the door swung open and Sylvester beckoned me to enter. An overpowering mixture of perfume, room deodorizer, aftershave lotion and body wash almost knocked me to the floor. A can of air freshener was in one paw of Sylvester; in the other a lighted fragrance candle. I had heard from other members of Mindy’s Menagerie that Sylvester had been acting a bit strange lately and decided to check up on my friend. To be truthful, I couldn’t understand what the heck Sylvester was talking about. His popularity had never been better; So much so that dad moved his table to the end row to handle the larger crowds waiting to see him. More people equal more hands and therefore more hand sanitizer. In fact, there was talk of adding Sylvester’s wife, Chocolate, to the show. I realized that Sylvester needed help with his “I Stink” phobia. After a few minutes of small talk I left, assuring Sylvester that he smelled no different than any of the other animals in Mindy’s Menagerie. Walking towards my room I again heard the familiar hissing sound of air freshener coming from the little skunk’s room. I decided that it was time for an intervention. The intervention would be in the pen of Pokey the Porcupine. Attending were Purse the Alligator, Scarlet the Boa Common Constrictor, Cuddles the Rose Hair Tarantula, Pokey and myself. Sylvester arrived a few minutes later. With head hung low he opened the door and entered. A strong fragrance of Old Spice followed him into the room. Pokey the porcupine was the first to speak. “Sylvester, you worry that people find you offensive. They think you stink. 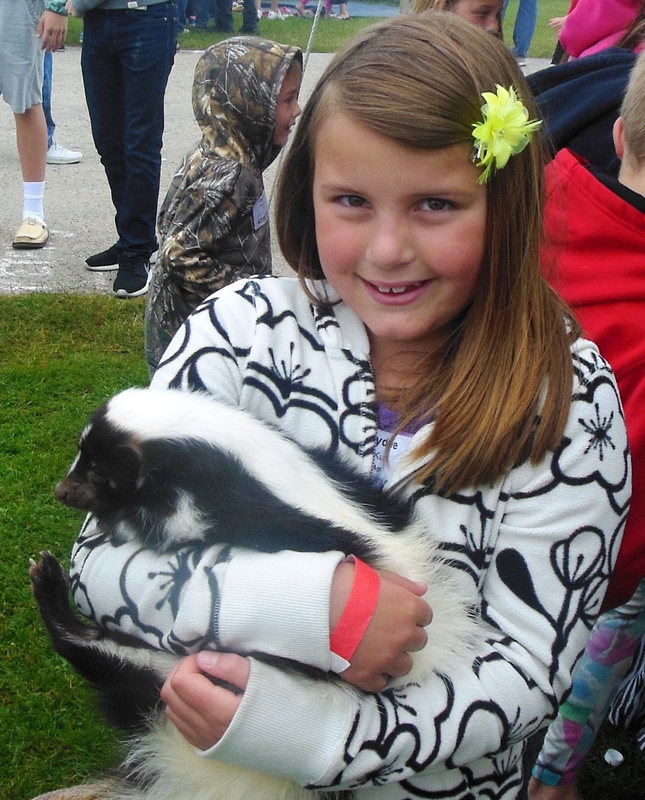 You are a skunk and people were taught that all skunks stink. Yet people stand in line to hold you and take selfies with you. 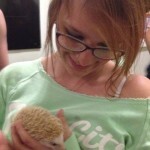 I am a Porcupine. People think all I do is shoot “quills” at them. 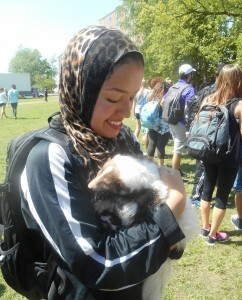 They never hold me and only the bravest will pet me.” Purse the Alligator was next. “When they look at me they think of Jurassic Park. Why do you think I am always smiling when people hold me.” One by one each animal told Sylvester of their own fears and concerns. 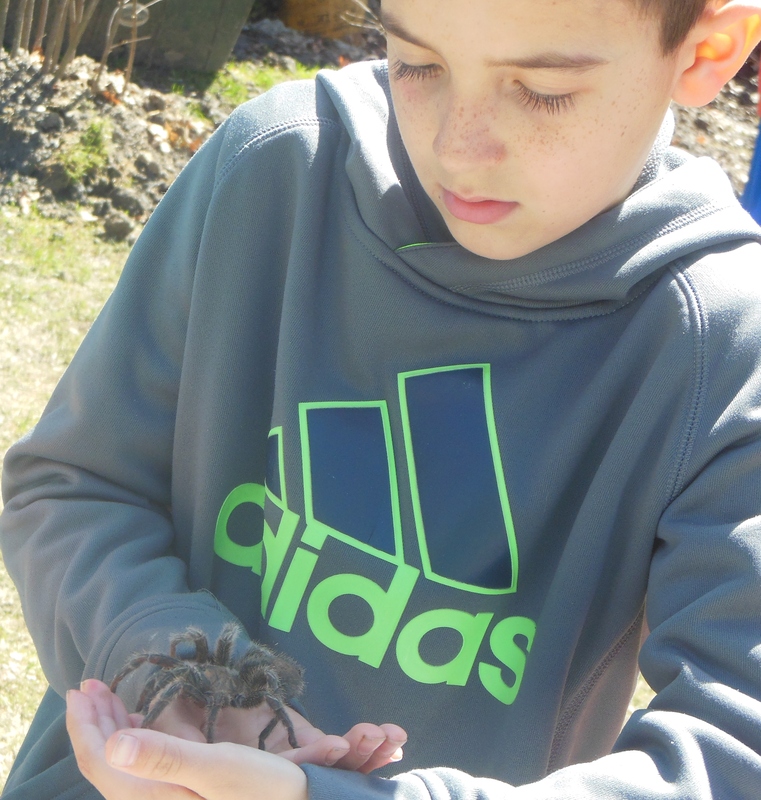 “If I bite someone, they think they will die, Cuddles the tarantula said. How crazy is that?” “When I squeeze someone, it’s gently and meant with love. I’m not trying to break their bones and eat them” remarked Scarlet the boa constrictor. Sylvester finally realized that everyone felt they were all misunderstood. They were the victims of “MYTHS”. 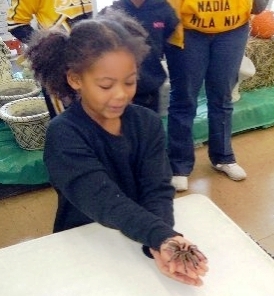 ITSY, BITSY SPIDER? I DON’T THINK SO! You can call me icky. You can call me scary. You can call me creepy. Just don’t call me itsy-bitsy spider. Those who follow Animal Rentals and Mindy’s Menagerie know me as CUDDLES the CHILEAN ROSE TARANTULA, but that is just my stage name. To others I am called a Chilean fire tarantula, the Chilean red-haired tarantula and for you language geeks (Grammostola rosea). 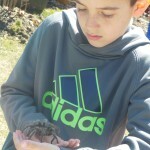 If you have met a pet tarantula it was probably one of my relatives. 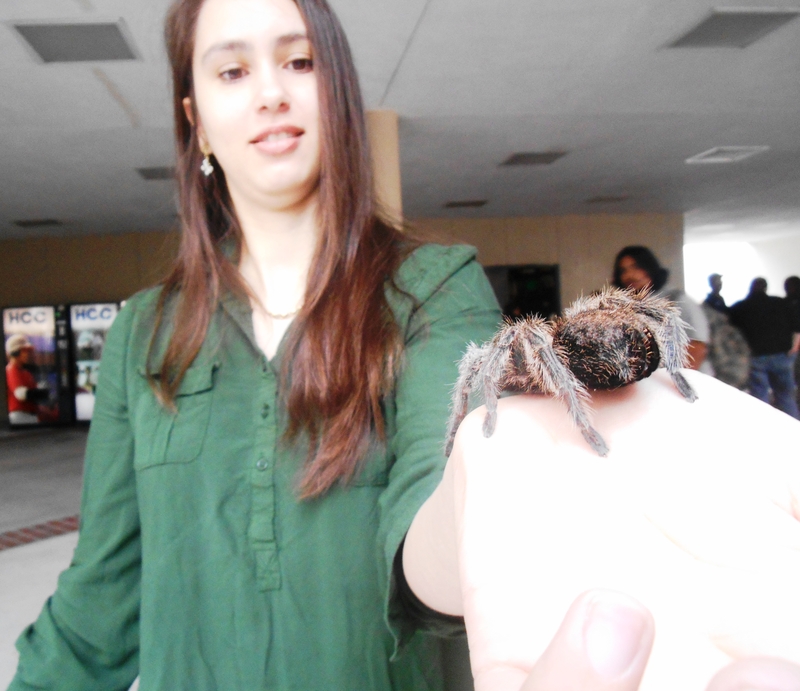 We are the pet lovers’ spider because of our small size and relatively gentle temperament. We are patient and rarely want to fight. But if you mishandle, tease or push us too far, we are on you like a pack of “wild spider monkeys”. Here is a helpful hint you can use. If you ever observe a tarantula raise its front legs and shows its fangs its warning you that this is not the spider you want to mess with that day. Their bite won’t kill you (it’s kind of like a bee sting) but you’ll wish you had remembered my helpful hint. 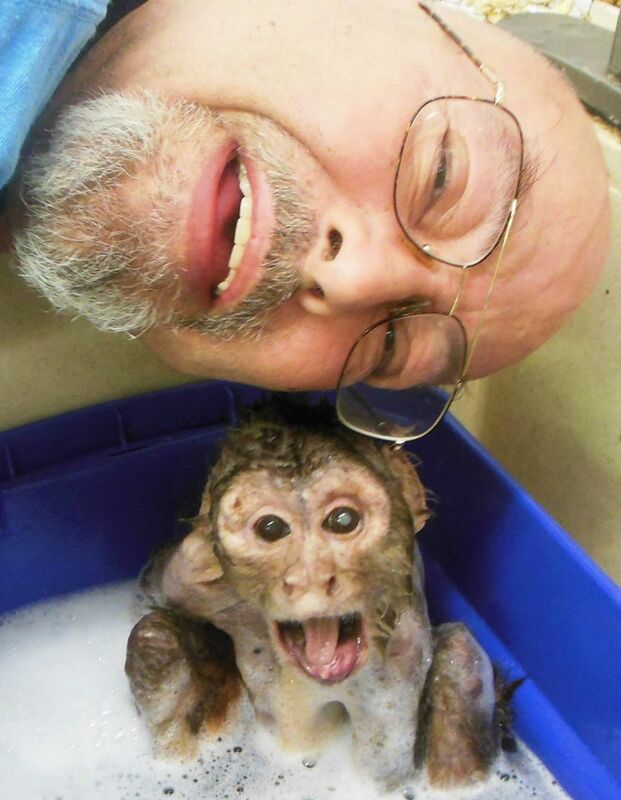 Because of my gentle nature, I am the victim for many of the practical jokes Mindy the monkey and her cohorts love to play. I’ve gone to sleep at night only to awaken and find four of my legs tied together. On Halloween everyone dressed up like a spider, sprayed me with cans of silly string and said they were “spinning webs”. Someone in the exotic petting zoo repeatedly signs me up to participate in 5 and 10 K runs all over the city. And because I’m a girl, you’ll see the name “Cuddles” on numerous dating sites. I know it’s all in good fun but sometimes it gets me so frustrated I can’t sleep and pace back and forth in my tank. And having four pairs of legs, that’s a lot of pacing. It’s no wonder I’m always tired. I was hatched in 1989 making me one of the older members of Mindy’s menagerie. I am also one of the more popular especially with the kids. I love watching their eyes widen when they see me for the first time. They slowly inch their way towards my table and for a few minutes do nothing but stare at me. I hear the whispers. Is it real? Does it bite? And at every show there is someone who, to my horror, begins to hum “Itsy Bitsy Spider” under their breath. The best part of our demonstration comes when one of the handlers places me on someone’s palm. I can feel them tremble and sense their fear. This is my cue to move slowly along their hand and up the arm eventually coming to rest on their head. Once assured that no harm will befall them the fear turns to laughter. Cell phone cameras click and soon photos and selfies make their way to friends and relatives. I am a social media sensation! I do not have a mate and actually prefer to be single. If I chose to start a family my partner would not be around much once the young arrived. Males of our species only live 3 to 7 years while females can live up to 20 years. Talk about “girl power”. 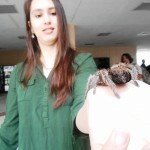 The nice thing about being a Chilean Rose tarantula is we girls rarely have weight issues. In fact we are notorious for going on extreme fasts which can last for a few weeks. But when we eat, we eat well. Crickets, grasshoppers, moths, beetles, cockroaches (a reason why my habitat was recently moved far away from the Madagascar hissing cockroaches), meal worms and small lizards make up the bulk of our diet. At Animal Rentals my handlers offer ”gut loaded” insects which give me all the nourishment and nutrition necessary. LIKES: Clean sand in my terrarium, fresh water, nourishing food and being part of a“hands-on”experience with Animal Rental friends. 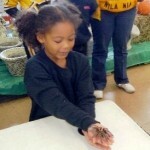 DISLIKES: Tapping on my terrarium, people who are afraid of me and that horrible, horrible song, “Itsy, Bitsy Spider”. I know that Mother’s Day is not for a few weeks yet, but today I wanted to tell you a little bit about our “mama” here at Animal Rentals. Her name is Mrs. Clean and she really takes care of me and all my exotic animal friends of Mindy’s Menagerie. She is really loving, sweet, and small. Mrs. Clean is a Hairless Rat. 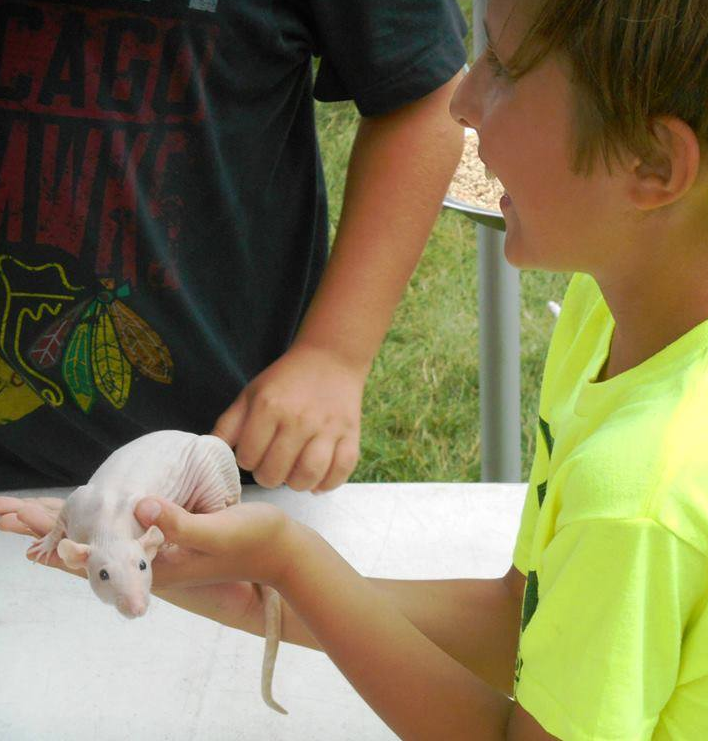 A lot of people are scared of rats or think they are unclean or carry diseases. 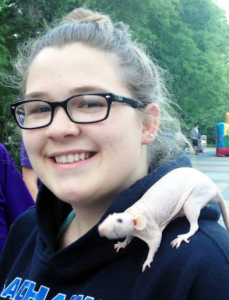 But rats are actually very clean and friendly and incredibly smart…maybe even as smart as monkeys! When I typed that Mrs. Clean just said, “Yes, dear, we are as smart as monkeys but it is not polite to brag about it.” I won’t argue, we never argue with “mama”. She is always right and besides that we wouldn’t want to do anything to upset her because we love her so much. Back home at Animal Rentals, Mrs. Clean helps us and reminds us too. You will often hear her say things like, “Purse, be sure to brush those big alligator teeth so you can keep your nice, white smile.” And, “Let’s blow a fan on Chi-Chi the Chinchilla so he is not so hot while the rest of us are so cold.” And “Bugsy, you Madagascar Hissing Cockroaches need to stop stealing Mindy’s cookies when she’s not looking.” Mrs. Clean is the best! She loves people, too…especially children. She really enjoys traveling to all different types of parties, events and locations for our Animal Shows – she thinks birthday parties are the best because she adores kids and cake. Her favorite part of working with Animal Rentals is meeting all the new people and hugging them while they hold her. Most people don’t even realize that they are being hugged by Mrs. Clean – she is so light and gentle and soft! They think they are just holding her but really, she is holding them right back. That’s our “mama”, Mrs. Clean the Hairless Rat. She just loves and cares about and cares for and takes care of all of us. We are lucky to have her. Next time I’ll tell you about Mrs. Clean’s favorite philosophy and why “Bald is Beautiful”. One could probably say street performers have been around since streets were invented. 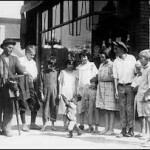 It is estimated that the first organ grinder appeared about 300 years ago. They were crude, very small with only a few notes. Originally designed as an aid to encourage canaries to sing, one day an enterprising young man in need of money took one of these organs outside and played it. Over the years the organs improved. The larger they grew, the more pipes were added. Soon they were capable of playing complex melodies with many different notes. 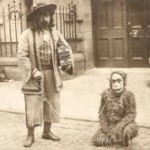 Like any street performer in the 17th and 18th century the organ grinder himself was the subject of adoration as well as contempt. What was looked upon as entertainment by some was viewed as begging by others. The inventions of the radio and phonograph would come years later leaving the melody of the organ grinder the only source for music and dancing. People would give the organ grinder coins to show their appreciation. Organ grinders at this time were disliked because they were typically foreigners and sometimes used small children in their acts. Then someone came up with the idea of using an animal. 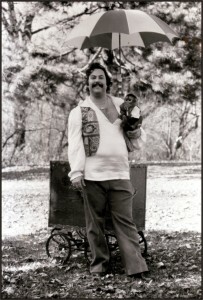 Many animals were incorporated to attract attention to the organ grinder. Birds, cats, and dogs were just a few. While they were all successful to a point, there was no one around to collect the money. Monkeys were often used because they possessed a thumb that allowed them to carry a cup to hold coins. Today, if you ask anyone to give you a description of an organ grinder they will tell you, “a man dressed in old clothes and floppy hat with a monkey playing music”. 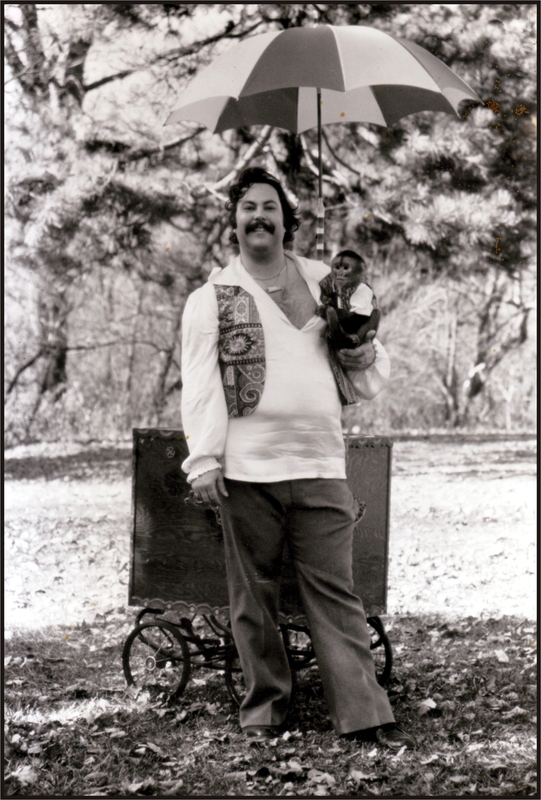 Bill Hoffman crisscrossed the country with Mr. Adam Monk as one of the last remaining organ grinders with a monkey. Shopping malls, auto dealerships, grand openings and just anyone who wanted to attract people hired Bill and Mr. Monk to do what their forefathers had done: amuse and entertain the audience. They did it well. The brightly colored organ, the whimsical, old fashioned music and the delight in seeing a real live monkey beckons them to come. The times may have changed but the people have not. They listened and danced to the music and to show their appreciation place some coins in the monkey’s cup. 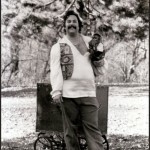 The past few weeks have been sort of strange and sad here at Animal Rentals since my Uncle, Mr. Adam Monk, passed away. 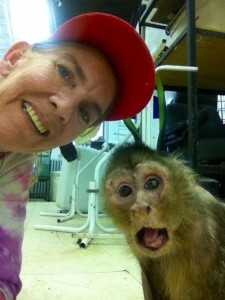 All of my human and exotic animal friends in Mindy’s Menagerie here sure miss him! But it has been wonderful getting notes from people that knew him. Uncle Monk was one monkey people never forgot meeting! Uncle Monk was 43 when he left us – which is pretty old for a monkey. Even though he lived to a ripe old age, people say that it is never long enough. The sad truth is, though, that most animals just don’t live as long as humans do. A lot of my tropical bird friends – like Ruby the African Grey Parrot or Piwackett the Scarlet Macaw – can live 60 to 75 years or longer! And there are some whales, giant tortoises and other animals that live for more than 200 years. But most domestic and exotic animals have a much shorter time on earth. So we should be happy that Uncle Monk had 43 years, and an incredible life. Dad, of course, misses Uncle Monk the most. The two of them started Animal Rentals and built the business together. Of course dad says he did it and Uncle Monk just helped, and of course Uncle Monk said that all the best ideas were his and he was the “real” boss. I really miss all the great advice he gave me – like when I was learning to be an Organ Grinder monkey and Uncle Monk told me to never take the pennies from people, only the “big money”. If someone ever handed him a penny while he was working he would actually throw it right to the ground. If it wasn’t silver or green, he wouldn’t take it. Lol! Uncle Monk retired years ago, so he never traveled with us for our College Entertainment shows. 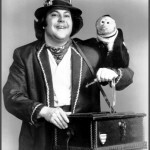 But he certainly did his share of touring and working with lots of people and celebrities doing Animal Shows, charity events, theme parties, strolling entertainment, fairs, festivals, corporate parties, birthday parties, commercials, tv shows…you name it and Uncle Monk was there putting on a show and making people laugh and smile. I am happy and proud to continue the work he started here at Animal Rentals and to carry on his legacy of making people laugh and smile. Goodbye Uncle Monk…I love you and I miss you! 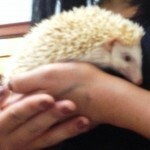 Hi everyone, my name is Horace, although many of my Animal Rentals friends like to call me “Pokey Junior”. If you have seen a picture of Pokey the Porcupine on Mindy’s Menagerie on our web page you can figure out why they call me “Junior”. 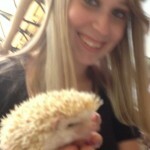 I am an African Pygmy Hedgehog but I have no idea where Africa even is. I was born somewhere near Cincinnati,Ohio. My great great grandparents were bred as pets to stay small. Great great grandma was an African hedgehog; great great grand-daddy was a Syrian. I am the result of their breeding. 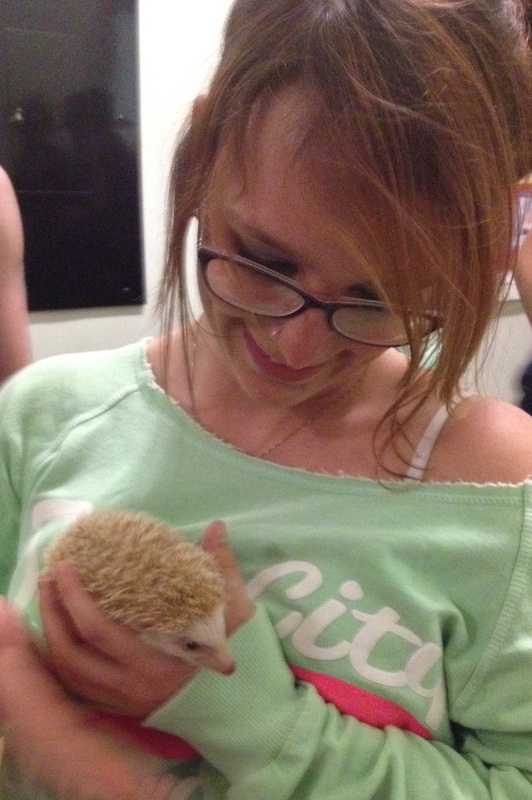 As a baby, I was called everything from “hoglet” to “Hey You“ before the good people at Animal Rentals gave me the name Horace. With our small size came some genetic quirks. Most members of my family have poor vision. A strong sense of smell and keen hearing help to compensate. In my younger years when I was lean and mean and could run over 6 feet a second and up to 3 miles a night on my exercise wheel. I still jog but its more like 6 feet a day. While travelling I run laps in the room until someone yells at me to stop or I run into a wall. Recently, I was told by our vet that I am lactose intolerant. There goes the nightly milk and cookies. Being the curious animal that I am, I researched my history and found that my ancestors were domesticated as early as Four BC. Problem was we were raised for our meat and quills. 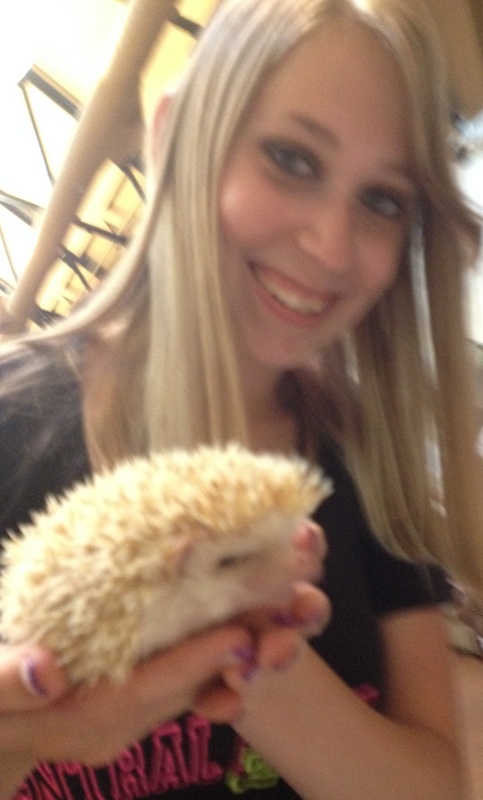 I could find nothing, however, on how we got the name “hedgehog.” A few days later the mystery was solved. I passed by the kitchen and heard mom and dad eating lunch. Hearing the grunting noises and the racket they made while pushing their food around sounded like two pigs eating out of a trough. It was not a pretty sight. I must confess I am a lover and not prone to fighting. I follow a simple motto: When the going gets rough, I get going. In the event of a confrontation, though, I pity the fool who goes against me and my 5000 sharp spines that surround my body. Thanks Mother Nature. I’m kind of a loner, sleep most of the day and prefer to be by myself except for when we do our exotic animal show display. To keep me fit I eat a diet consisting of insects, slugs, earthworms and a nasty tasting commercial hedgehog diet. I sometimes wonder what a Madagascar Hissing Cockroach would taste like. I know its wrong and I feel bad. After all, they are members of Mindy’s Menagerie and Bugsy is a friend. But in my defense he also is a BUG. I take comfort by telling myself that Bugsy would be the last roach to be eaten. One of the perks of being a hedgehog is that the venom from an adder, a poisonous snake, does not affect me. But how many adders will I run into while walking the streets of Chicago? The guys around here don’t believe me and are attempting to convince Mindy the Monkey to ask her dad to add an adder to the show. So not funny! LIKES: ANIMAL RENTALS, a clean cage, fresh water, good food (maybe including some Madagascar Hissing Cockroaches), entertaining our audiences and a heavy duty toothbrush for my 64 teeth . 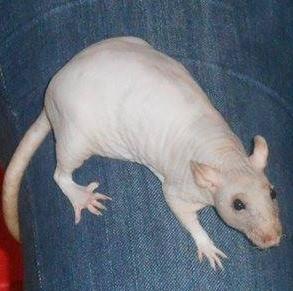 DISLIKES: a dirty cage, anyone who calls me “Pokey Junior” and those times when I have a “bad spine day”. POKEY AND SCARLET: WHO WOULD YOU CHOOSE? Pokey is a home body who enjoys the quiet life. He is a team player when working with his companions in Mindy’s Menagerie but once the work day is done, he retreats to his solitary lifestyle. STRENGTHS: Thrifty, Practical, Creative, Witty and Sharp. WEAKNESSES: Shy, Small Stature, a Loner and painfully Sarcastic. POKEY possesses a very pungent and disagreeable odor that is quite unpleasant, a result of either hereditary or just poor hygiene. He also possesses a rather “prickly” attitude especially when he is upset, which makes his body shake resulting in more than one of his sharp quills to loosen and stick someone. Not a great people pleaser. Scarlet is a laid back and cautious reptile who knows her large size may be intimidating. Her seductive, come hither look makes her very popular in Mindy’s Menagerie where she considers herself to be an interactive and “hands-on” specimen. STRENGTHS: Quiet, Intelligent, Calculating, Stoic, Charming and an uncanny ability to adapt to change. WEAKNESSES: No arms or legs and a forked tongue make travel and communication difficult. Not someone you would want to dine with. She looks slimy and hugs too hard. SCARLET, while very approachable and personable, faces a very uphill battle. She tends to lash out when cornered into situations she is not familiar with. She is tired of the insulting phrases “snake in the grass” and “lower than a snake’s belly. She has had to live down the misconception that she was responsible for the debacle with Adam and Even in the Garden of Eden. (She said it was a porcupine who tempted Eve). 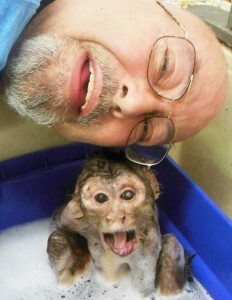 The other day was bath day here at Animal Rentals, and I got some great pictures of my dad and my uncle, Mr. Adam Monk. I love seeing the two of them together, and dad loves reminiscing with Uncle Monk about “the old days”. Uncle Monk is over 45 years old! And he and dad have been together a REALLY long time…working, traveling and playing. Uncle Monk doesn’t travel with us doing Animal Shows or College Entertainment any more, he says his days of being on the road are done and he just wants to relax and enjoy his retirement. I LOVE traveling and don’t think I will EVER want to retire! But Uncle Monk and I are completely different. I guess Uncle Monk is really more of my brother than actually an uncle, since he was dad’s first monkey son. But he is old and sort of crotchety – which dad tells me is a nicer way of saying cranky, lol – and certainly more like an uncle than a brother. So he is Uncle Monk to me. Uncle Monk has had an amazing life – even before he met dad. He was born in the wild in the jungles of South America, and he was captured and kidnapped and SOLD when he was very young! He traveled from village to village in small, bamboo cages being sold and traded until he finally came to America and met dad. Dad likes to say that it was NOT love at first sight – lol. 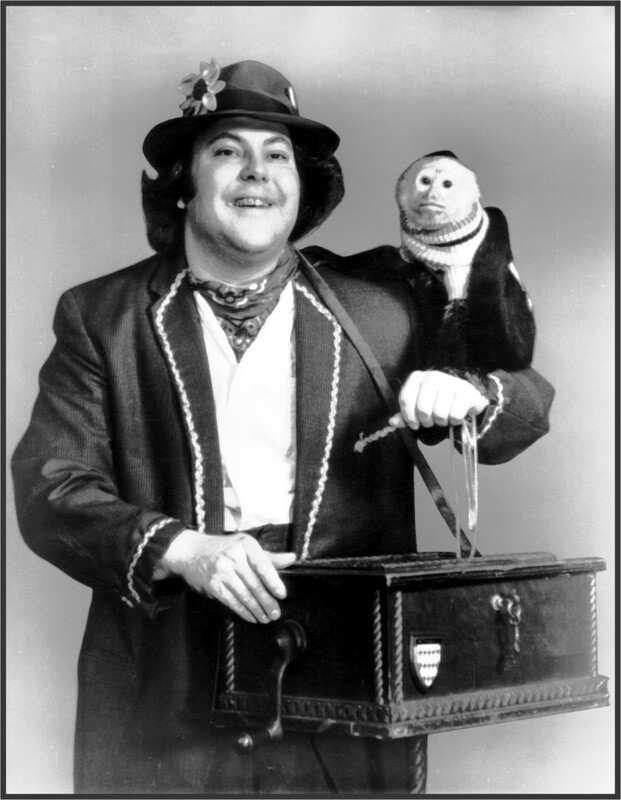 But he and Uncle Monk grew to first respect then love each other, and together they built Animal Rentals from a highly demanded Organ Grinder act to a business that focuses on bringing people and exotic animals together in an educational and entertaining way. I even think that it was Uncle Monk’s idea to do our Petting Zoos and Pony Rides. At least, HE says it was. Dad just rolls his eyes and laughs whenever I ask him about it. Anyway, I guess after such a long life filled with work and adventure Uncle Monk deserves to relax and be pampered in his retirement. And he sure does love his bath time! I don’t blame him, I do too! What about you? Do you love bath time too? Animal Rentals, Inc., licensed by the USDA, is fully insured and has been in business for over 40 years.